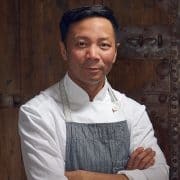 Chef Duncan Ly is one of Calgary’s most well-respected and beloved chefs. His career has taken him across Western Canada and found him working at some of the country’s most esteemed dining establishments including Tofino’s Wickaninnish Inn, Vancouver’s Diva and Calgary’s Catch, Hotel Arts, Kensington Riverside Inn and as Culinary Director for The Vintage Group of restaurants. In January of 2017 he launched his first independently owned restaurant Foreign Concept, a modern Asian restaurant.